The holidays are stressful for wholesalers and distributors, with challenges coming from both ends of the supply chain. Consumer demand spikes wildly as retailers offer increased discounts, and suppliers are winding down operations for workers to take vacation. The most prepared wholesalers and distributors are the ones who began planning months ago. But even if you didn't start forecasting your demand back in July, it’s not too late for you to take the stress out of your Q4! 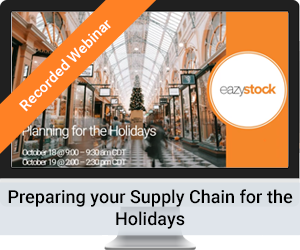 Watch our 30-minute webinar "Preparing your Supply Chain for the Holidays" to find out what steps you can take for the coming holidays and keep your operations running smoothly.